While keeping open the possibility of a late playoff push, Edmonton Oilers captain Connor McDavid acknowledged how much losing has worn on him this year. In Buffalo, Sabres captain Jack Eichel grew irritated when asked about his team's inability to win consecutive games in nearly three months. "I don't have an answer for you right now," Eichel said following a 5-2 loss at Toronto on Saturday, a day after beating Pittsburgh. What's becoming abundantly clear since McDavid and Eichel were selected with the top two picks in the 2015 draft is it takes more than the arrival of a so-called "once-in-a-generation" star to transform a losing team into a contender. "It's a team sport. 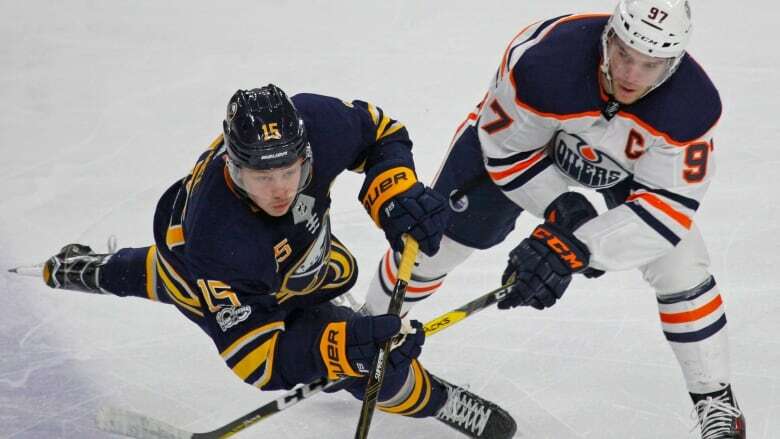 Things don't get fixed with one player," Sabres forward Kyle Okposo said before a 4-3 loss to the Oilers on Monday night. "They can certainly help. But it's a collective effort." The game against Edmonton was an example of Okposo's viewpoint. Eichel scored twice, including his career-high-matching 25th, but the Sabres squandered a 3-1 second-period lead. McDavid and Eichel are the faces of their respective franchises based on both production and salary. The 22-year-old McDavid is in the first season of an eight-year, $100 million contract, and the 22-year-old Eichel is in the first season of an eight-year, $80 million deal. Their respective teams have barely made a dent in the standings, with both entering the final month of the season in jeopardy of missing the playoffs. The Oilers have advanced to the playoffs just once with McDavid, in 2016-17, when they were knocked out in the second round by San Jose. Buffalo is in the midst of a franchise-worst seven-year playoff drought, and finished last overall twice with Eichel. Both teams also have changed GMs and coaches since 2015. The Oilers fired general manager Peter Chiarelli and coach Todd McLellan in separate moves this season. The Sabres dismissed GM Tim Murray and coach Dan Bylsma in April 2017. 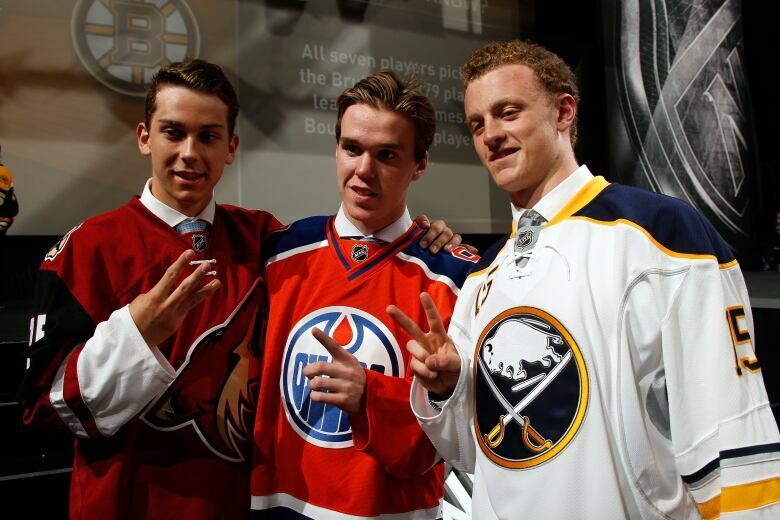 It doesn't come close to the expectations right after the 2015 draft in Florida, where the Canadian-born McDavid was picked first and the American Eichel second, to the delight of each team's respective fan base. As much as McDavid and Eichel dislike the comparisons to each other, they're in agreement in saying how unfair the expectations were. "I don't think that's possible at all," McDavid said of one player changing a franchise's trajectory. "I don't think in this league, where it's so competitive each and every night, that one guy can change it." McDavid has won two scoring titles and was the league's MVP in 2017. Overall, McDavid's 348 points (120 goals, 228 assists) in 271 games are third among NHL players since 2015-16. Eichel has 249 points (98 goals, 151 assists) in 272 games, and ranks 29th over the same span following Monday's game. Inconsistency has all but scuttled the Sabres' playoff chances this season. In going 13-22-6 since a 10-game winning streak in November, they've gone from briefly sitting atop the Eastern Conference standings to 11th, and nine points out of contention. It's a slide during which Buffalo has failed to win consecutive games since Dec. 11-13. Eichel has been among the few constants. His worst point drought lasted five games. "It's a team game and you need everyone pulling in the same direction," said Eichel, who has a career-best 72 points this season. "It's the best league in the world. You can't expect it to be easy. And I think we all expected it to be hard, and I think it has been." The Oilers slipped out of the playoff race following a 1-8-2 skid that began on Jan. 19. Edmonton has rebounded by going 5-1-2 in its past eight, but still sits 11th in the West, and six points out of contention. With 33 goals and 59 assists, McDavid is the first Oilers' player to reach 90 points in three consecutive seasons since Jari Kurri (1983-1990) and Mark Messier (1987-90). "Connor does a ton for us, and obviously, you see the offensive numbers, but it's more than that," forward Sam Gagner said when asked how the Oilers might miss the playoffs despite McDavid's contributions. "We still feel like we have an opportunity to get back in this," Gagner added. "We're still in the playoff picture. And hopefully we can get there and put that issue to rest."